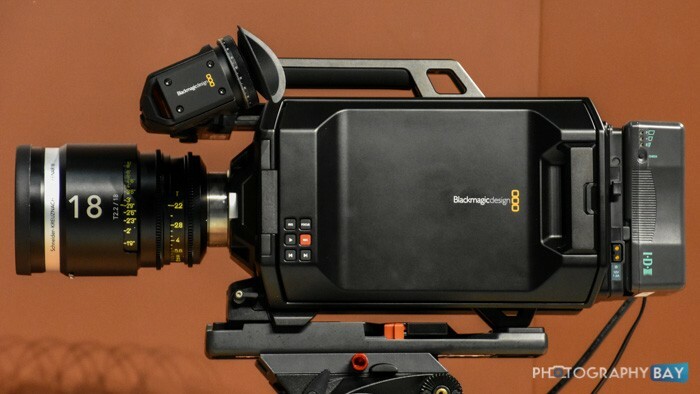 Today at NAB 2015, Blackmagic Design unveiled its 4.6K update to the URSA cinema camera. The new sensor is a Super35 format with 4608 x 2592 lines of resolution and is capable of an impressive 120fps. Blackmagic claims an astounding 15 stops of dynamic range. The URSA records 12-bit lossless Cinema DNG Raw files to internal CFast card slots. Additionally, it can record in Apple ProRes codec for quicker turnaround. The URSA 4.6K model retails for $6,995 for the EF model and $7,495 for the PL-mount model. Limited availability is expected in July with larger quantities expected in late July and into August. Aside from the sensor upgrade, the URSA 4.6K remains largely unchanged from last year’s 4K URSA model. And those familiar with the URSA 4K model may recall that Blackmagic touted that it would be capable of modular upgrades to the sensor. 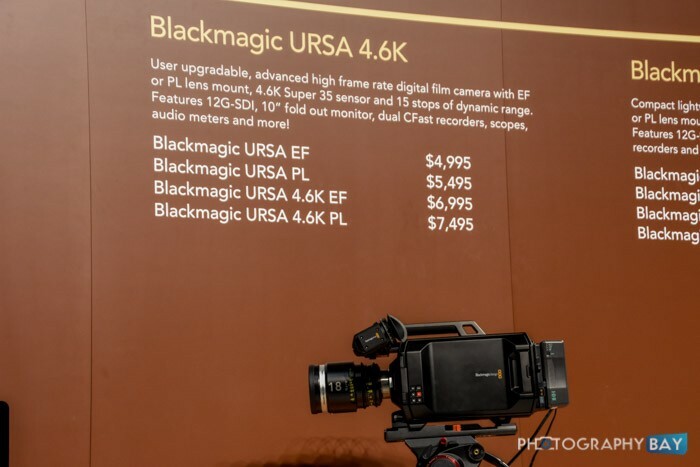 To that end, Blackmagic is releasing a 4.6K “turret” upgrade for current URSA owners, which allows them to easily upgrade the camera themselves. The sensor turret is removable via four bolts on the front. You can purchase the upgrade from Blackmagic for $1995 for the EF mount and $2495 for the PL mount. The original URSA 4K camera also gets a $1,000 price drop effective today. The URSA with EF mount is now priced at $4,995. This puts it in line with the upgrade path to the new 4.6K camera since the sensor turret upgrade runs $2,000 more than the 4K camera price. One of the biggest complaints about the original URSA was the lack of a proper viewfinder. 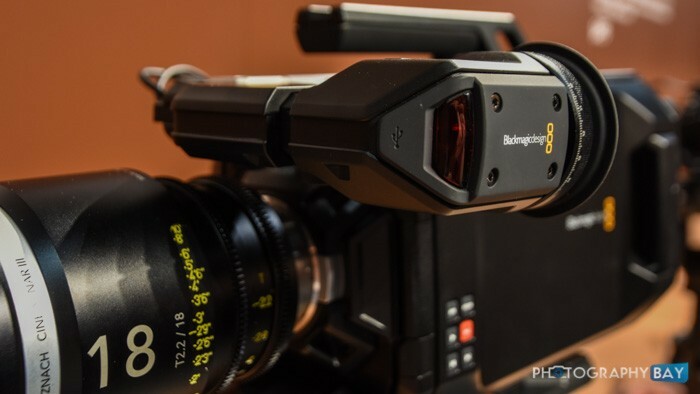 Blackmagic has eliminated that flaw with a new $1,495 viewfinder available as an accessory for the URSA and URSA Mini. 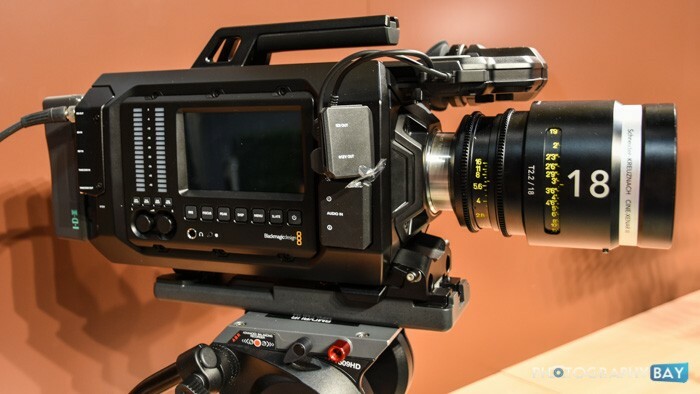 The URSA Viewfinder features a 1920 x 1080 OLED display with an adjustable diopter and connects to the URSA using standard SDI and power connections. It has a built-in record tally light and can be configured for left or right eye operation. It is expected to ship in July 2015.